As the heart of the home, the kitchen is a room that you want to get right when considering a renovation. More than just a place to store and cook food, the modern family kitchen is designed to also be a place to eat, come together as a family, and a social hub for entertaining. While modern families come in all different forms, so too can the modern kitchen. Take a look at some of the current design trends to see what suits your own lifestyle. One of the biggest trends in modern kitchens is the move away from looking like it’s a room designated to be just the kitchen. 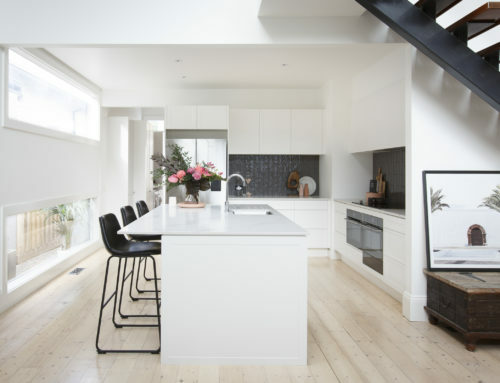 Open plan living has brought the palette of surrounding rooms into the kitchen, with the trend being to connect these areas to be congruent. Do you want to be able to talk to your family and watch TV while cooking, without it feeling like another room? Or host a party within your kitchen and outdoor deck, with the two connected seamlessly? This is possible within open plan living by designing with a palette and materials that integrate both spaces. Truly integrated living is best demonstrated when it’s not obvious where your kitchen ends and your living room begins – they’re connected by both style and function. To this end, functional elements of the kitchen like the fridge, coffee machine, dishwasher and bins are all things that can be hidden away by integrating your appliances into the kitchen cabinetry. This is a popular way to make the whole area look neater and more stylish – especially when lounge or chill out areas share the space. 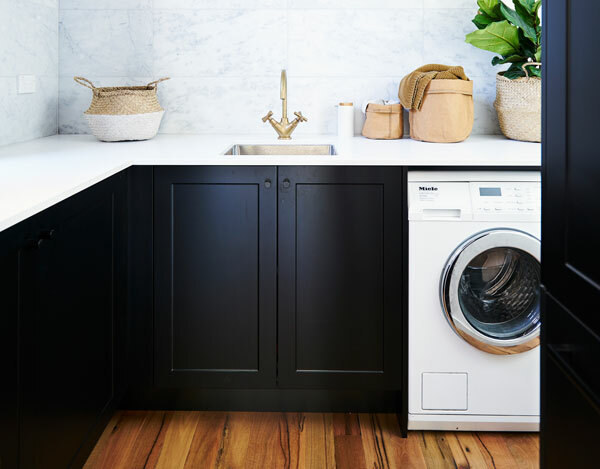 Whilst the modern kitchen is connected to the living space, the modern laundry is often connected to the kitchen. 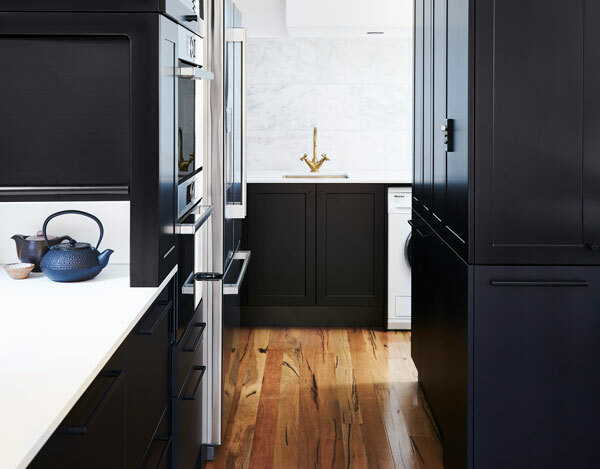 Whether physically connected to the kitchen as part of a butler’s pantry, or located is in its own separate room, the trend is to use the same palette and materials to match the kitchen. 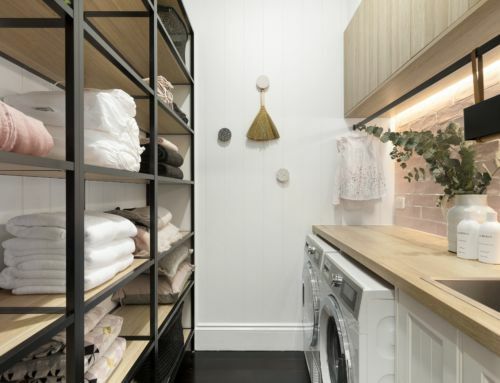 This elevates the laundry room to be a much more pleasant space to work in, and creates a sense of continuity of style throughout multiple rooms in the home. 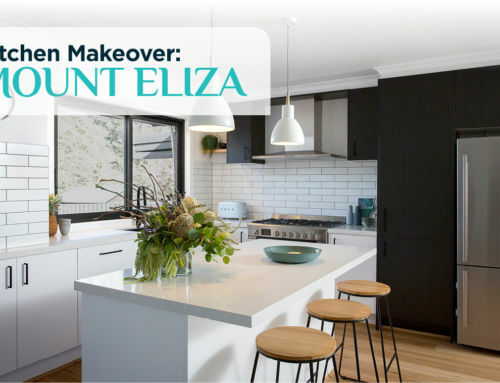 So if you’re looking to renovate your kitchen, be sure to also consider renovating your laundry at the same time – it makes sense to tackle them as one project if you like the idea of having matching cabinetry, benchtops, sinks and taps. When talking tones and materials for modern kitchens, organic luxury is a trend that’s gained a lot of traction. 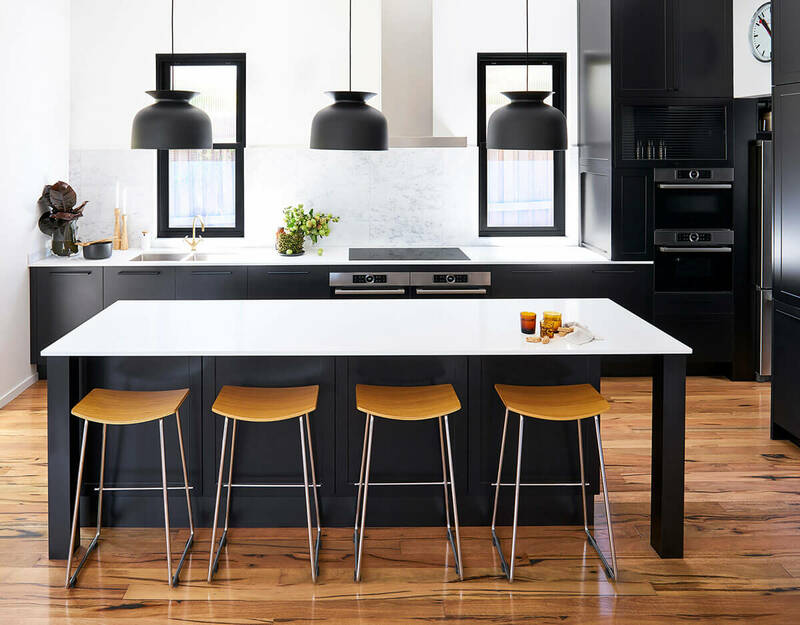 Cool concrete, warm timber, and the look of natural stone are elements that are right on trend and will lend high end appeal to a contemporary kitchen. 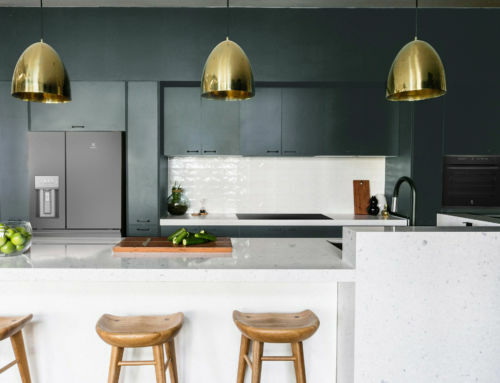 Kinsman Kitchens offers a range of cabinets with that look and feel like textured concrete, available in both dark and light grey tones – a perfect option when you want a neutral look that’s more contemporary than just plain white. The latest range of timber-look benchtops also complement the organic luxe trend, with a realistic look and textured feel. 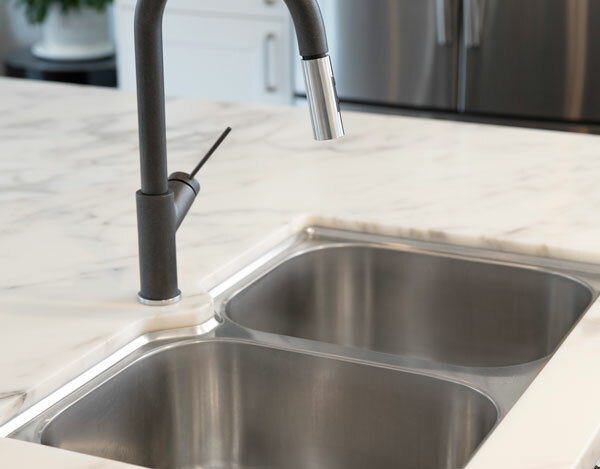 As a hard-working hub that can take on multiple roles of prep, cooking, serving, eating, washing, and laptop workspace, island benchtops have become the central focus of modern kitchens Design yours to be as large as your layout and budget allows, and decide whether you want to integrate functional elements like your cooktop or sink, allowing you to look into the living space while using them. 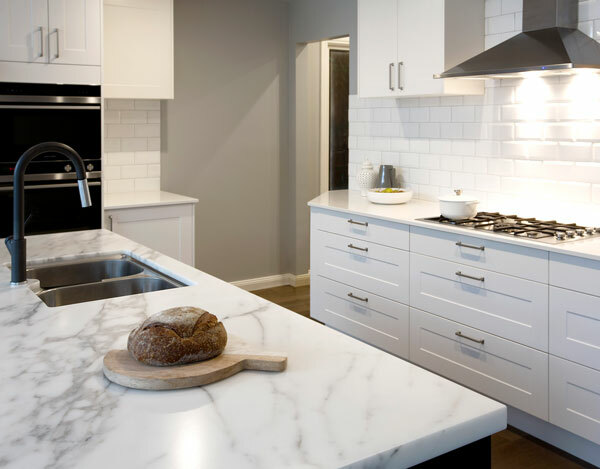 While the look of natural marble and stone has endless visual appeal, the demands of modern living has made the hi-tech properties of the latest laminates and manufactured quartz a hugely popular choice in modern benchtops, for both practicality and affordability. For the most affordable option, be sure to check out Kinsman Kitchen’s range of hard-wearing laminate, with finishes ranging from gloss, matt, satin, timber ,or even the look of natural stone or concrete. Modern living is all about contemporary style and clever details to make daily life that little bit easier.  So when it comes to kitchen storage, having ample space that’s well organised will take your kitchen from feeling outdated to perfectly designed for you. Pantries are key in the kitchen, and your kitchen design consultant can help you create one where everything has its place. From vertical pull-out shelves for easy access to spices, to built-in baskets of all shapes and sizes, a pantry make-over can give you renewed enthusiasm for cooking. Corner spaces can be maximized with swing-out LeMans shelving, perfect for storing pots and pans. Toasters, kettles or other appliances can be hidden away in a concealed appliance niche with a roller shutter. 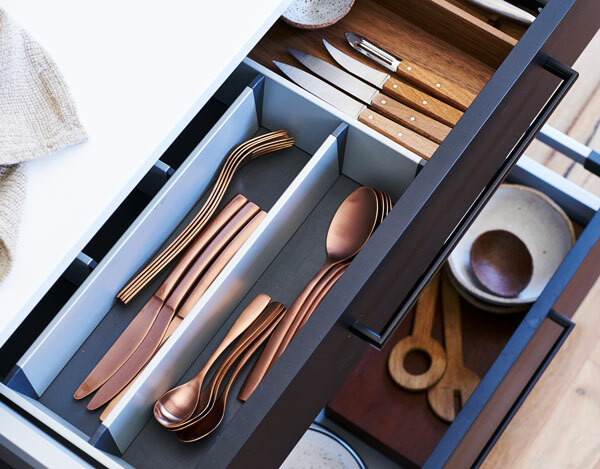 Even cutlery drawers can be a pleasure to use when you have simple internal dividers. 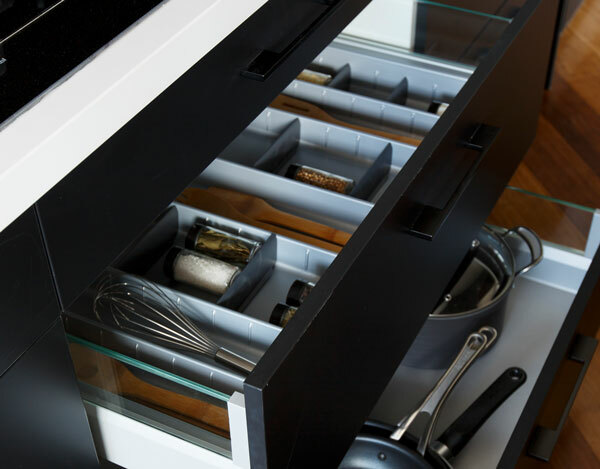 And if you need storage for household items beyond cooking utensils and accessories, putting in an upper run of cabinets all the way to the ceiling opens up a world of storage possibilities.